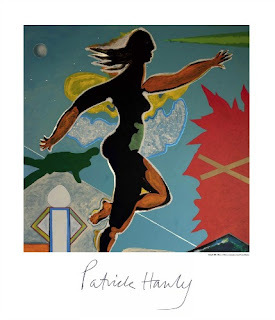 New Zealand Art Print News: First prints of Pat Hanly paintings for 20 years! Print of Pat Hanly's 1988 Painting "Doing It"
Just published and available to buy today from NZ Fine Prints are the first fine art reproduction prints of paintings by NZ artist Pat Hanly to be available since the late 1980s! In the words of the publisher "Over a career spanning four decades, Pat Hanly proposed a new manner of looking at New Zealand - the land and its people. His art heralded new ways of thinking about this country - as a nation that belonged to the young and the adventurous, to the dreamers and to those who could see the vital place the island nation could have within Polynesia and the broader Pacific." The two paintings that have been chosen for reproduction feature on the covers of the standard and limited edition versions of "Pat Hanly", a book recently published by Ron Sang Publications. The chosen paintings are Hanly's 1988 work "Doing It" (illustrated at left) and a 1973 still life painting "Telephone Table". The large-scale reproductions showcase two paintings from an output which "must stand as the most vivid, animated body of paintings by a single artist to have yet hailed from New Zealand."